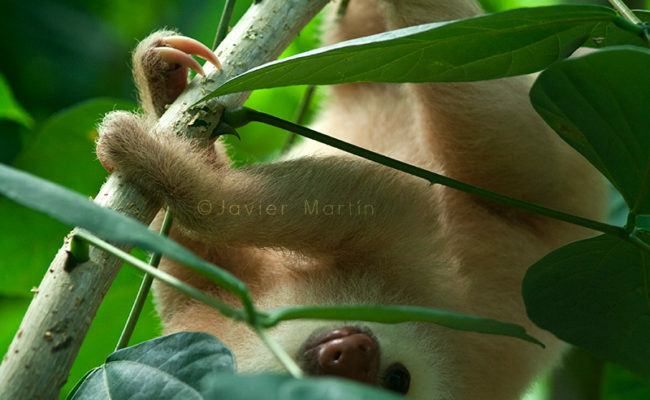 Sloths are quite interesting mammals, they used to belong to a group of animals that either they don´t have teeth -like the armadillos- or if they have teeth these have no enamel, like in sloths and ant eaters. 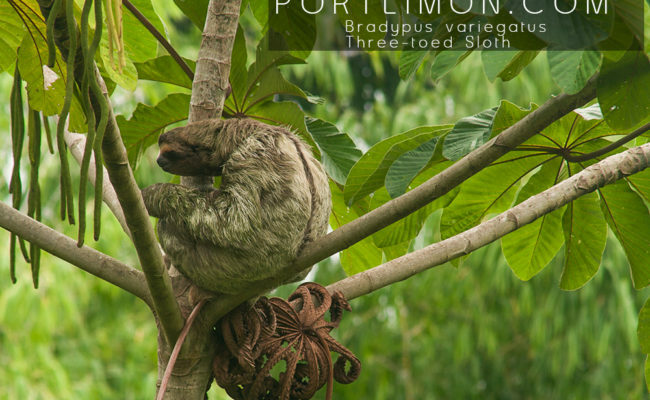 Recent reviews in taxonomic field have changed things into a quite different system, but for our practical purposes, we will stick to this old fashion categorization of this interesting animals. 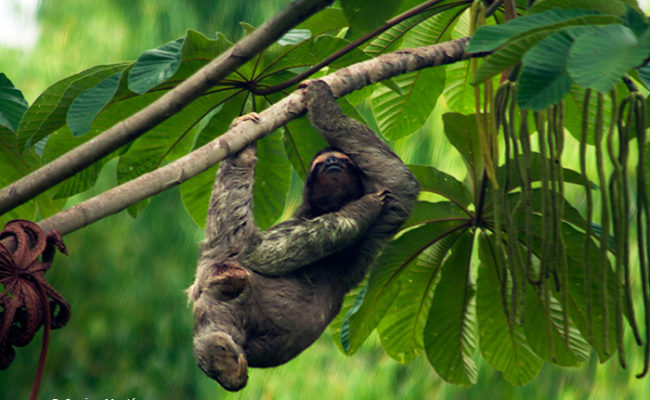 Two species are found in Costa Rica: the two-toed sloth, and the three-toed sloth. Both are found mostly all around the country. 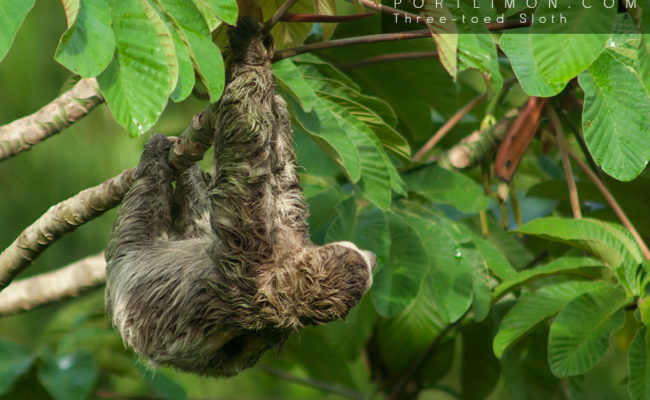 Despite the fact that their diet is based mainly on tender leaves and flowers, there are some reports of sloths eating insects, lizards and even birds, probably as a complement of its diet. 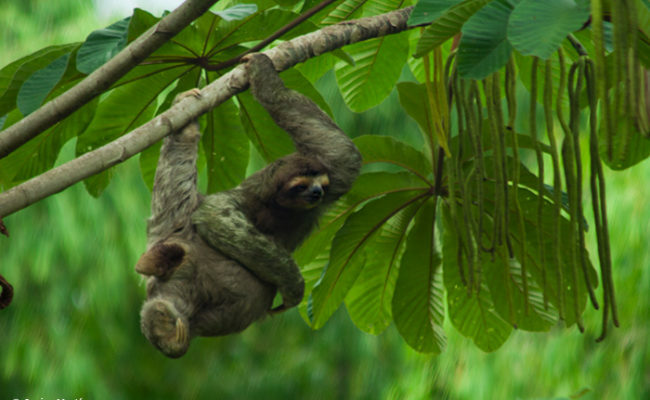 Their slow movements are apparently a way of saving energy considering the low source of energy of their diet based on cellulose. But some others consider that a slow moving pace is the best way to avoid their main predators which are; the Harpy Eagle while on the tree tops, and the Jaguar while on the ground, due to the fact that both predator “see” only quick movements . 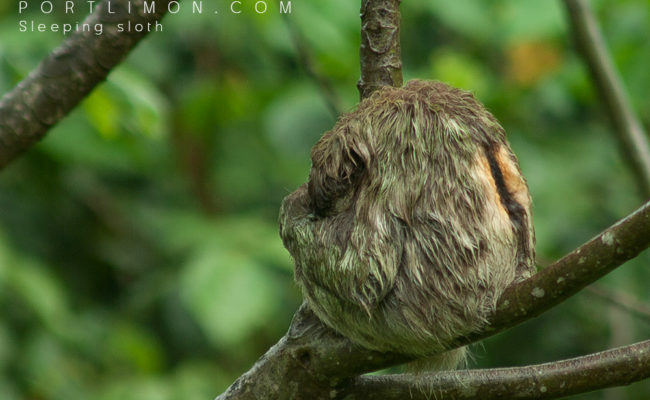 This last theory is quite interesting because it fits with another weird characteristic of the sloth, which is that each hair of its heavy fur is hollow, then humidity gets inside each hair and an algae grows, turning the fur in some cases into a fairly green color and therefor, a fabulous camouflage in order to avoid predators. 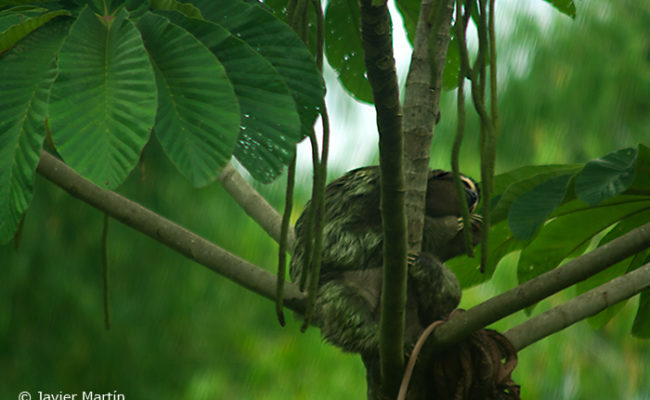 This fact takes us to the following interesting question; Have you ever seen a green mammal? 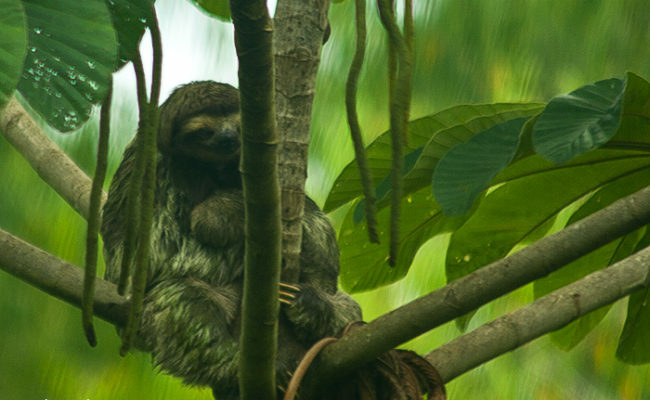 Birds, Lizards, Snakes, Frogs, and some other animals are green, but not a single mammal is green but this one, and happens because of a symbiotic relation between the sloth and the algae. Why should they visit the ground? 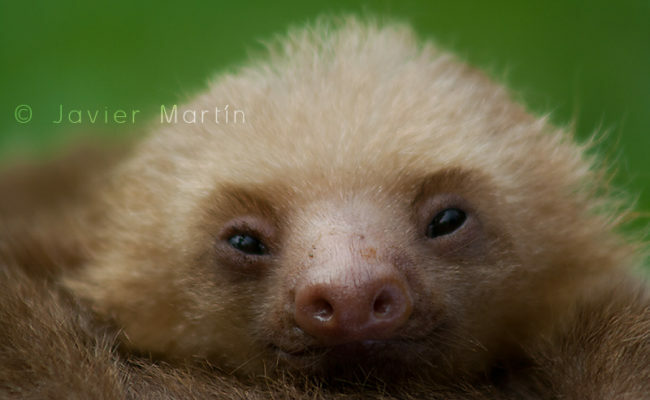 Its not clear why, but at least once a week the sloth descends from the treetops in order to defecate in the ground, besides that, it digs a sort of tiny hole where he leaves its droppings and after this, it covers them with dirt seconds before this, a bunch of tiny flies that live in the sloth's fur jump quickly into the droppings, lay eggs on them, and fly back to the fur before the sloth covers them with dirt. 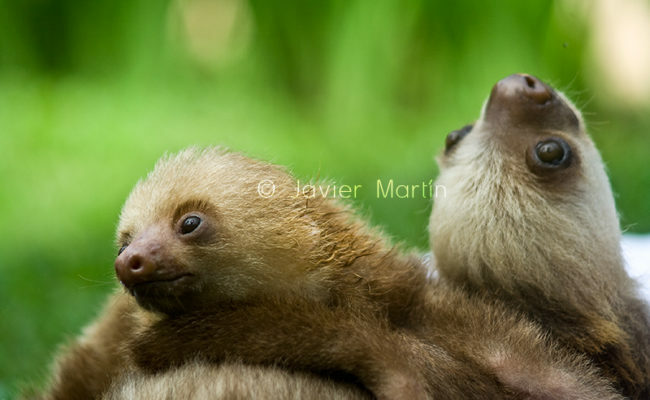 This is obviously a huge mystery because not only the sloth is forced by this behavior to expose itself to jaguars once in the ground, but it´s also highly vulnerable at this moment because their body was designed to hang and not to stand in the ground. 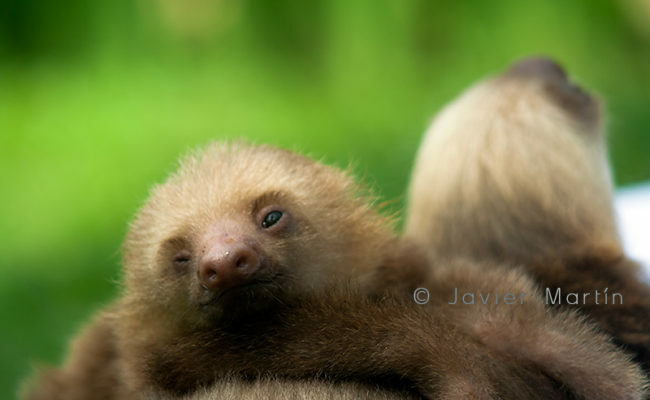 Ready for your shore excursion where sloths can be observed?